For nearly a century, astronomers have puzzled over the curious variability of young stars residing in the Taurus-Auriga constellation some 450 light years from Earth. One star in particular has drawn astronomers' attention. Every few decades, the star's light has faded briefly before brightening again. He hopes to make more observations of the star in the future, to see whether the amount of iron surrounding the star has changed—a measure that could help researchers determine the size of the iron's source. For instance, if the same amount of iron appears in, say, a year, that may signal that the iron comes from a relatively massive source, such as a large planetary collision, versus if there is very little iron left in the disk. Wasn't It Dr. Oliver K. Manuel of the UM-Rolla who claimed so many years ago that the Sun has an iron core? 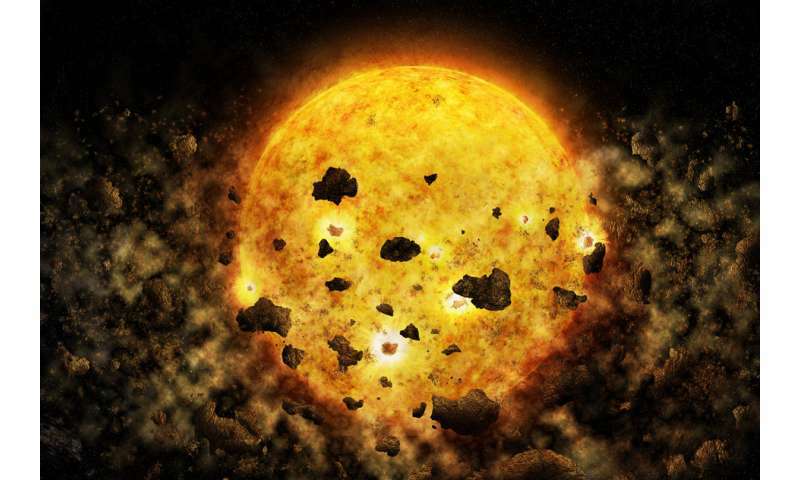 Could it be said that his theory of an Iron Sun bears at least SOME similarity to the processes described in the above article as to how a young star may acquire a large amount of Iron? By the way, whatever happened to him? I enjoy reading old PO articles and comments and have come across Dr; Manuel's theories where he was castigated mightily as a crackpot by his fellow commenters. I could not understand why he chose PO to make an attempt to garner some fans for his ideas, and he a former NASA Principal Investigator.